Having a portable shooting target stand that will work with multiple target types is as good as any you can come by. This stand can be used with wooden, cardboard, or paper targets by adding your own 1x2 lumber to create your own personal customize shooting experience. Its top carry handle makes bring it with you a snap and the tough steel spike ensures the stand hold tight to the ground. Heavy duty 1/4" thick steel construction. Going for a custom height target? With this shooting target stand you have full customization with the anchor points and screws to place the targets at any desired height. Will work with wooden, cardboard, and paper targets. 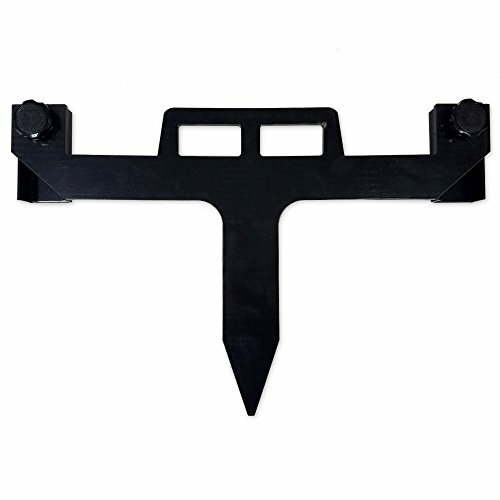 Has a tough ground spike to secure this target stand in the ground when in use and is easily portable with its lightweight nature and top carry handle. Target stand for shooting range measures 18" wide. Direct Outdoor Products has over 10 years of experience designing and manufacturing Shooting Targets. This all comes from over 20 years of experience in product development and design. We strive to always help outdoor enthusiasts perform better while having a memorable experience in the field. It is our mission is to fulfill your needs and exceed your expectations by setting the bar through innovation, safety, service, and experience. Our commitment to you is quality products with an unbeatable value. Take your experience to the next level with Copper Ridge Outdoors! STEEL CONSTRUCTION: Shooting target holder is made of a 1/4" thick steel frame. USE WITH MULTIPLE TARGET TYPES: This shooting target stand can be used with wooden, cardboard, and paper targets. CUSTOMIZATION: Use with your own 1 x 2" lumber to get the exact use out of your target stand. PORTABLE: Lightweight and top carry handle design makes this target stand for shooting outdoors easy to take anywhere and use the touch spike to stick into the ground. WIDE DESIGN: Copper Ridge Outdoors target stand with spike measures 18" wide. If you have any questions about this product by Copper Ridge Outdoors, contact us by completing and submitting the form below. If you are looking for a specif part number, please include it with your message.